Alexa Internet, Inc. is a California-based subsidiary company of Amazon.com which provides commercial web traffic data. Founded as an independent company in 1996, Alexa was acquired by Amazon in 1999. Its toolbar collects data on browsing behavior and transmits it to the Alexa website, where it is stored and analyzed, forming the basis for the company's web traffic reporting. According to its website, as of 2014, Alexa provides traffic data, global rankings and other information on 30 million websites,and its website is visited by over 6 million people monthly. Amazon.com seeks to be Earth's most customer-centric company, where customers can find and disc over anything they might want to buy online, and endeavors to offer its customers the lowest possible prices. Site has numerous personalization features and services including one-click buying, extensive customer and editorial product reviews, gift registries, gift certificates, wish lists, restaurant and movie listings, travel, and photo processing. China's largest and most used Internet service portal owned by Tencent, Inc founded in November, 1998. Presently, Tencent is aiming its operations at the strategic goal of providing users with a "one-stop online life service". 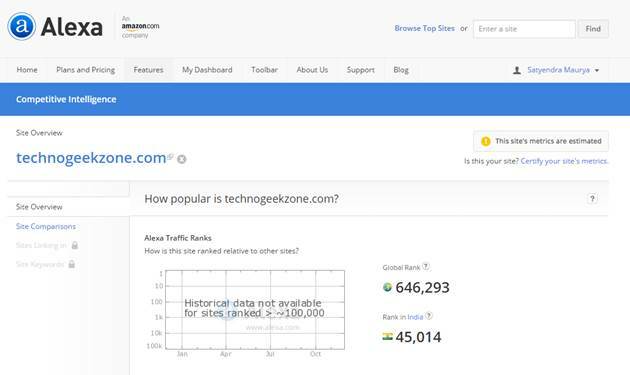 Whether you had top level domain or you work on subdomain such as *.blogspot.com or *.wordpress.com still you could enjoy and get benefit of alexa rank. Anywhere across the web if you send your webiste for analysing it or for selling, they firstly analyse your website's alexa rank and the display the result respectively. 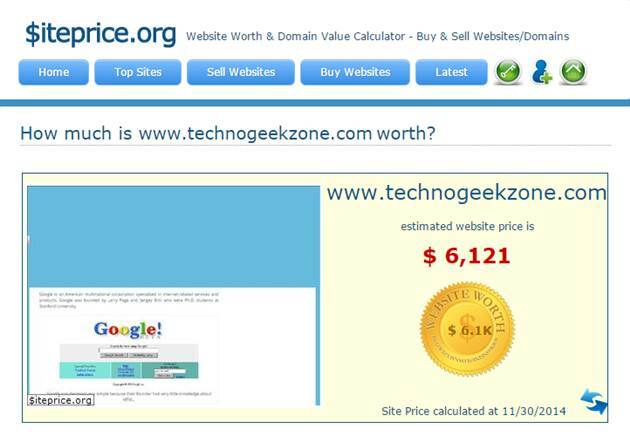 for example: According to Siteprice.org when TGZ had no alexa rank it showed it's price $240 but currently TGZ is having a good rank and Now Siteprice.org gives a price above $6000. >>>Some month before I registered a domain and before I was working on a sub-domain but after purchasing a domain my next work was to give more quality posts.From that time I started focussing more on quality and uniqueness. >>>I also stopped using other templates and turned on to Blogger's simple look and modified it according to my need because I found it is more suitable and fast. Before I was using Mashable like theme called as Dynamo but it didn't performed well so I changed the outlook. >>>As already discussed before alexa rank depends upon popularity of website and contents because Content is Overall King. >>>Try to comment on other blog with high Page Rank and give ideas to the other peoples questions in comment form because if they will find you correct they will sure visit your website. >>>Commenting on other blogs will not only increase your page views but also will increase site trust which you can see under "Site Linking In" column in alexa. >>>Write Posts which attract visitors to come and visit your site but remember that you should not spam across the web because spamming might be harmful for your website. >>>Take help of Social Networks such as Facebook,Google Plus and Twitter to make audience from across the globe. >>>You can also use third party websites to increase popularity such as Advertising or fixing with popular websites or any paid SEO services which crawls your website from time to time. >>>Stop dreaming about having a good rank if you can't write well because everything depends upon how you satisfy your visitors problem. Blogging is all a work of patience so keep calm and do blogging. Nice stuff.I would like to visit your site again for more updates. Thanks for your comment!!! We are glad to hear from you.